The Stingher 10m GT has a totally new deck layout for the 2018 season, which has been designed using the latest technology, with comfort, spectacular performance and handling being foremost in mind for the end user. Designed from the knowledge Stingher has gained in almost 35years boat building, and with their passion for perfection, the Stingher 10m GT is testament to this goal. The Stingher 10m GT is equally at home being used as a large family sports Rib, as it is when chosen as a Super Yacht tender. The position of the helm unit is extremely comfortable with its twin bucket seats giving you very good lateral support, and houses the electric fridge and stainless steel sink. However we do have several styles of alternative seating available including shock mitigation Scotseats. The main console has been moved forward for better weight distribution and totally re-designed to allow more room for latest larger instruments and gauges to be fitted. The console also has a large door in the front, with integral seat. This opens to reveal an electric flush toilet and sink, and also doubles up as a changing room or lockable storage area. Moving the console forward has allowed for a very large U shaped seating and dining area to be created in the stern for all your guests. There is further storage in the seat lockers and access to the rear platform, which houses the ladders and shower. The front sundeck and bow area has additional storage lockers, a through locker for skis, and an electric windlass. With the addition of a detachable table you can create a further dining area for six people. To further enhance your experience on-board there is the latest JL Audio full remote control sound system with Media master and Bluetooth. Designed to take up to 800hp via twin 400hp outboard engines, the Stingher 10m GT utilises it’s proven high performance deep V hull, which provides an exceptionally dry and smooth, soft ride, with impeccable handling for you and your passengers. 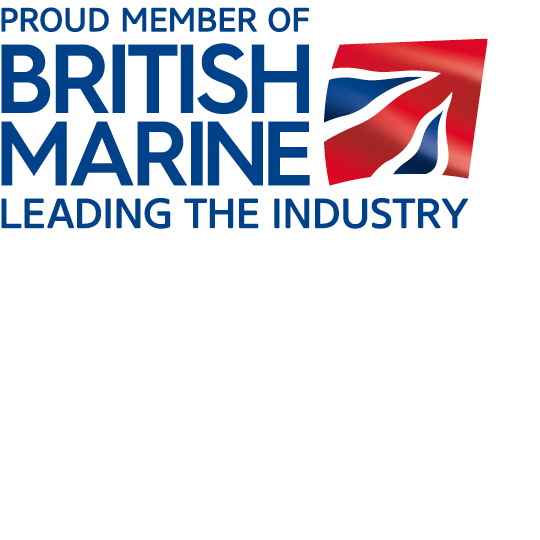 This superb specification is only available at Stingher UK through our Bespoke Custom Design department, which enables us to finish in Southampton to the highest quality, and have the boat set up by professionally by seven times World Offshore Powerboat Champion Neil Holmes, to fulfil your requirements. The Stingher 10m GT is a true thoroughbred from the Stingher stable. 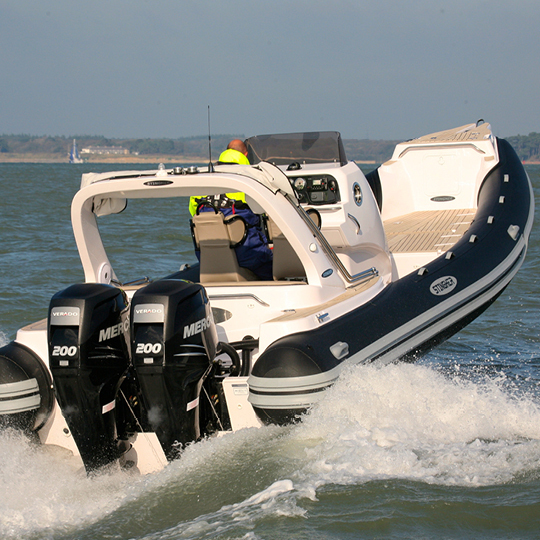 The 10 metre was tested, at the same time as the Scorpion Sting 10m Cabin Rib and the Hunton 904 inboard by Paul Lemmer on behalf of RIB International in a very choppy force 7 in the Solent. On the day it was the only RIB to achieve 50 knots, whilst at the same time remain dry other than side spray from the wind, something that he said could not be boasted by the other Ribs that day. It was rated by him as one of the most capable 10m hulls available. This RIB really is a true cruising machine. We recently had a 10 metre fitted with twin Mercury 350 Sci engines. Capable of 63 knots, and developed by seven times World Champion Neil Holmes. Described by Alex Smith, editor of Sports Boat and Rib magazine, in a test as a 10 metre RIB with a Ferrari engine,.. what we have here is a fearsomely good boat that I have no doubt with its breadth of abilities and its aggressive pricing will see it toppling some very big names in the World of luxury Ribs. 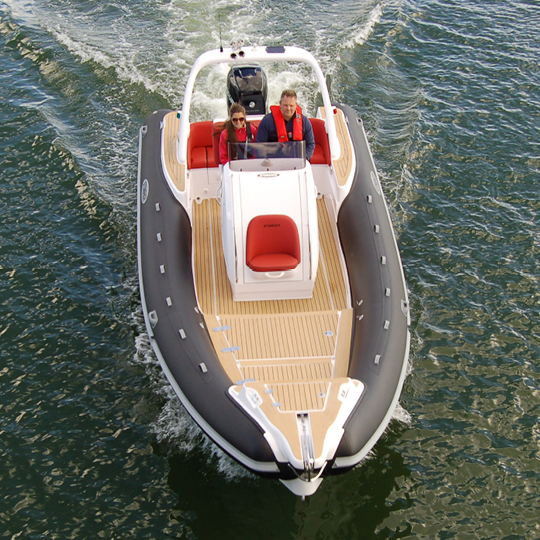 As further testament to its exceptional build quality, equipment levels, comfort, and sea handling, it is one of only four RIBs in the over 9 metre category to be recommended by Rib International in the 2009 Super Yacht Tender buyers guide. The Stingher was the largest of the four recommended, and was the least expensive, with the most expensive being almost double the price.